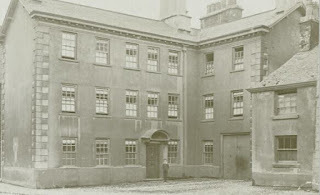 Blind Beck House is situated on the West side of Hightgate, and backs onto Blind Beck, the boundary between Kendal and Kirkland. The house was built in the late 18th century as the town house for Christopher Wilson (his initials appear on a rain spout) There was however, a house on this site before this, owned by Thomas Wilson, a woolstapler and hosier, who lived in the original Blindbeck house until his death in 1757. His huge estate was passed to his son Christopher, who later had Blindbeck house rebuilt and modernised. Chrispher Wilson built his business empire on the back of his father's earlier successes. His hosiery business was a nation wide success, and he had a part share in a ship exporting goods to America. He also had his hand in the production of gunpowder in Sizergh, in the selling of linseys (a coarse woven frabric of wool and cotton using flax grown locally) caps, gloves, flannel, baize, silk, yarn, dyes, soap, oil, looms, stirrups, fish hooks, chease, hams, char (fish), rum and port. Christopher Wilson ran the business with one other person, who was responsible for taking orders and delivering them, and taking the necessary payments. He did a lot of business with customers in Liverpool, Manchester and Birmingham. Wilson's company did not own any factories, merely purchasing goods ready made, and selling them on. He also sold goods to customers in Bremen, Amsterdam and Hamburg, and records show that between 1768 and 1780, he sold £72700 worth of hosiery to over 80 customers. After rebuilding Blindbeck house, Wilson became a partner in one of Kendal's first and most famous banks, that of Maude, Wilson and Crewdson. He was also a trustee of the Kendal Fell Trust. His star continued to rise in 1798\99 when he became mayor of Kendal. The house was used as a convent in the 19th century, and a nightclub (Queens Nightclub) up until the early 1990's. 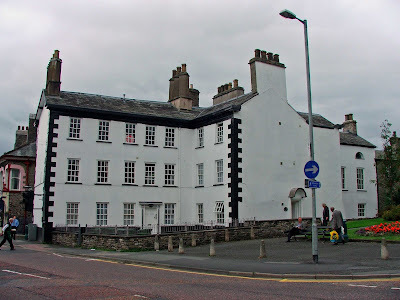 From 1995 onwards it was converted into flats, and remains a landmark building where the two parts of Kendal meet.